Life is too short to wear uncomfortable underwear so we have done some research and rounded up a list of what are the most comfortable men’s boxers briefs based on user reviews. We looked for styles that are made from super soft fabrics that feel comfortable against the skin, yet are also able to provide the kind of support that men need. We also made sure that the designs we list won’t cause any chafing, and won’t stretch out and bunch up like some underwear are prone to do. We have included a mix of everyday styles, performance sports designs, as well as a few options that are great for travel. The following are the brands and styles that have the best reputation for being comfortable and functional. 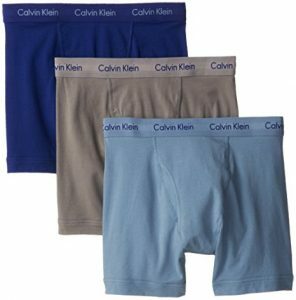 For a lot of men, the best design for pure comfort is the Calvin Klein Men’s Underwear Body Modal Boxer Brief. The fabric is modal, that is super soft and silky. It is a type of rayon that is made from the fibers of the Beech tree. Modal is known for being lightweight, soft, breathable, stretchy and can feel snug without feeling constrictive. It has become a favorite for a lot of men over cotton, especially if you are looking for softness. Modal will also keep you cooler in warmer months because it is so breathable. If taken care of properly (washing in cold water on delicate and air drying) this underwear will retain its softness, color, and shape without any fraying or pilling. This CK design has a slightly longer leg to make sure it doesn’t ride up, while the sculpted front “pouch” provides a good amount of support without feeling restrictive. The Tommy John ‘Second Skin’ Boxer Briefs are one of the most popular and talked about styles as far being one of the best styles around. The key features to this design that make it so popular are the contour pouch, the quick draw horizontal fly, and the stay-put waistband that stops the underwear from rolling down. The material for this style is 90% non-pilling micro modal blended with 10% spandex. The Second Skin is not cheap, but they are comfortable and breathable, while still being supportive enough that most men feel that they are worth the premium price. They are also loved because they won’t stretch out and bunch up. Since they are made from modal, you will probably want to take a little more care with washing this underwear to prolong the life of them. They fit most body types quite well and can be worn under anything from dress pants to athletic shorts to help stop chafing. They won’t ride up the legs, so you can easily wear them if you are moving around a lot. They come in a good range of basic colors and cost around $34 a pair. Some customers complain that they don’t last as long as they should for the price you are paying, but if you follow the washing instructions you should be able to get a decent amount of wear out of them. A good, yet inexpensive, option that seems to work well for most men is the Hanes Men’s Classics Boxer Briefs. They are an ultra soft 100% cotton (unless you get the pack with heather or the stripes styles that are less cotton), so you know they are going to be comfy. They have leg bands that won’t ride up and they are tagless with the Hanes logo appearing the waistband. The cotton has a little bit of stretch, but it does maintain a level of support in the right areas. The cost of this style works out to roughly $5 a pair, but you have to buy them in the five pack. Under Armour Underwear have a very dedicated following and are another of the best seller options in the boxer brief styles. Due to the huge popularity of this style, you can buy the Original Series Boxerjock all over the place. It comes in a few different lengths, including a 3″ that is more of a trunk style and a longer 9″ length, the 6″ is UA’s most popular length of the Boxerjock. You can also get this design with different fabrics and technology, and it comes in a good range of colors and patterns on the material. They are a little pricey, but if you buy a 2 pack you get a slightly better deal. The Original Boxerjock style can be worn for everyday wear, but they are especially popular for exercising because they provide excellent support to help keep everything in place without feeling restrictive. They are also highly prized for their ability to wick away sweat and odor. The waistband is comfortable for most men and it has a vertical fly for convenience. The other key feature of this style is the durability, as they will last you a very long time. The only downside to this style is that it has tags on the inner waistband that you have to remove. It is a bit puzzling why UA has chosen to include tags in their underwear when most other competitors have gone tagless and most customers seem to really dislike the presence of the tags, but if you can remove them without ripping the seams then the underwear is great. Overall the Boxerjock stretch well, recover, stay put, wick sweat, and keep you cool. Another great option if you are looking for a style that works well for working out and other types of exercise are the Adidas Men’s Sport Performance Climalite Boxer Brief Underwear. They are made of 91% polyester and 9% spandex, so they are similar to the UA Boxerjock, but they are slightly less expensive. They also don’t have a fly, while the UA style does have a fly. This Adidas style is specifically designed as sport-performance underwear, so they include features like a double-lined mesh support pouch and non-chafing stitching. Most men find the fit is quite good on this style and there’s no ride up or pinch in the back or groin area. The material is soft and comfortable, and it provides nice support so it holds everything in place. They also breathe really well, with the material wicking away the moisture quickly and keeping you dry. This is another style that is also very durable and should last for a number of years with very little loss of elasticity or holes forming. ExOfficio Give-N-Go Boxer Briefs are generally considered the best underwear for traveling, although some men love them for everyday wear. The reason they are so great for travel is that you can easily wash them in a sink and they will dry within a matter of hours, so it means you only have to pack a couple of pair per trip. Their key features are that they are breathable, lightweight, and are odor resistant. As far as comfort goes, they are made of a super soft synthetic mesh that feels very light on the skin that stays cool while still being supportive. They are also great if you are trying to avoid chafing during warmer and more humid summer months. Exofficio makes this product with 3″ or 6″ inseams. The other features that men love about this style are that they last forever, they look great and you can wear them with any type of pants or shorts and they won’t ride up or cause discomfort. Uniqlo’s bestselling Airism Boxer Briefs are an incredibly comfortable style that comes in either low-rise or regular rise, with a few different leg lengths, and a good selection of different patterns and colors. This is a great budget option if you are looking for a cheaper alternative to the ExOfficio Men’s Give-N-Go Boxer Brief that you can wear for travel. The Airism has similar features to the Give-N-Go, including fast drying, breathable material that dries almost as soon as you take it out of the washing machine (or sink), it even includes an elastic waistband that has quick-dry properties. It also features odor-neutralizing fabric that helps to make them more functional and good for travel. The microfiber fabric is so soft and light, you’ll forget you have them on. 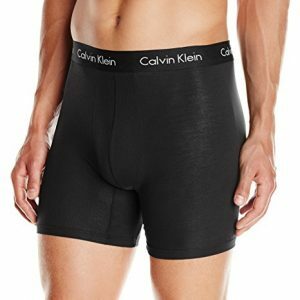 Calvin Klein has so many options for comfortable underwear that we have included 2 on this list. Our second Calvin Klein pick is CK’s Three-Pack Stretch-Cotton Boxer Briefs. It is getting harder to find good quality cotton options as more brands are moving towards modal, but this cotton style is a great quality design that is cool and comfortable, even in the summer heat. Since they are cotton they stretch and allow for air flow. 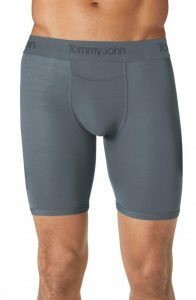 The support is fairly minimal and they are a bit more of a comfort, relaxed fit than some of the other options on this list unless you size down. Some people find the most comfortable styles are a little more snug while others like a relaxed fit. The Stretch-Cotton Boxer Briefs tend to be more of the latter style. The seams are made to not irritate or scratch your skin and the fabric moves with you and breathes extremely well. The fabric is 95% cotton and 5% spandex, with the spandex giving the fabric a little bit of stretchy support. They come in a variety of assorted colors. 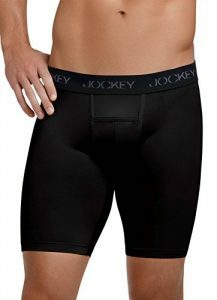 Jockey also have quite a lot of styles to choose from, one of their best and most comfortable is the Jockey Men’s Underwear Microfiber Performance Midway Brief. This is another option that is great for sports or working out. 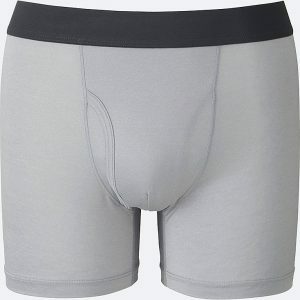 They are 80% polyester and 20% spandex, which is a fairly standard material for boxer briefs that are designed for sports. The fly has a horizontal style that the Tommy John brand made popular. This style is known for being cooling, looking good on most men, and being very comfortable. They are a great option if you are looking for a style to help prevent chafing while exercising. Some men have had issues with the durability of this style, but they only cost around $10 a pair so they are easy to replace if they do wear out. Mack Weldon, the internet based startup that was founded in 2011, has been having a lot of success with their different underwear styles. You can buy Mack Weldon’s underwear directly on their website. They pride themselves on their strong customer support and having a good relationship with the people who are buying their underwear. One thing that is cool about this brand is that they offer a try on guarantee on your first pair, so if you don’t like them you can switch them for something else or get a refund without actually returning the pair that you bought. The most popular style that Mack Weldon offer is the 18-Hour Jersey boxer brief. The fabric on this style is a blend of long-staple cotton, Lenzing Modal and Lycra which is anti-microbial (so it prevents odor), manages moisture and keeps you cool. The have a few different comfort features including seams are designed to stretch and recover, and comfortable materials. They are designed as an everyday underwear, but can work well for some men for exercise. The Labels are printed on the back/side of the leg, which is a little different and perhaps not for everyone.